How are the Fahrenheit, Celsius, and Kelvin temperature scales related? The Celsius and Kelvin scales use the same size degree (“incremental scaling” is the technical term), but set their zero values at different absolute numbers. 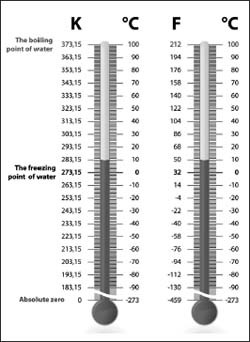 Let’s explain that sentence a bit more: If you go up by one degree Celsius or one degree Kelvin, you’ve raised the temperature the same amount, but 0 °C (the temperature at which water freezes) is 273.15 K. Thus the two scales are offset from one another by 273.15. Fahrenheit is completely different though. Water freezes at 32 °F, and a change of one degree on the Fahrenheit scale is equal to a change of 0.55 °C. A comparison of the Fahrenheit, Celsius, and Kelvin scales.